Based in a small rural village outside Sarkej, Ahmedbad, we visited Indigenous manufacturing centre twice on our production trip in India, first to view and work along-side the tailors on our initial samples and then two weeks later to view our final samples in our selected fabrics and dyes. Without wishing to be negative we didn’t find the area of sarkej, particularly safe as females and it was overwhelmingly busy and polluted. However, we soon came to realise that in this over populated city which thrived on textile production, manufacturing centres like indigenous are essential. Not only for their natural and sustainable production methods, in the thick hazy city but for its fair wages, safe working enviroment and ambition for women’s equality in the work place and the city. Ahmedabad is a dry state and predominately Muslim. Due to cultural reasons this makes it difficult for women to join male dominated work places such as the manufacturing industry, especially if it includes a long travel distance. Indigenous try to push the boundaries on this an employ several women in their workshop, assisting with quality control and packing. Though, they’d like to push this progression further and build a work space in local communities for the women, which would be a safe space to earn money and continue the heritage of craft production. Aadil one of the founders was a pleasure to work alongside, his enthusiasm for our collection and knowledge of production techniques for contemporary design was exciting. We had lengthily discussions about additional features to our products, finishes and fabric manipulations as well as what ethical and sustainable manufacturing means to him. This is why we feel strongly about production visits, they’re as much about collaboration and partnership as they are about trade and constructing our designs. 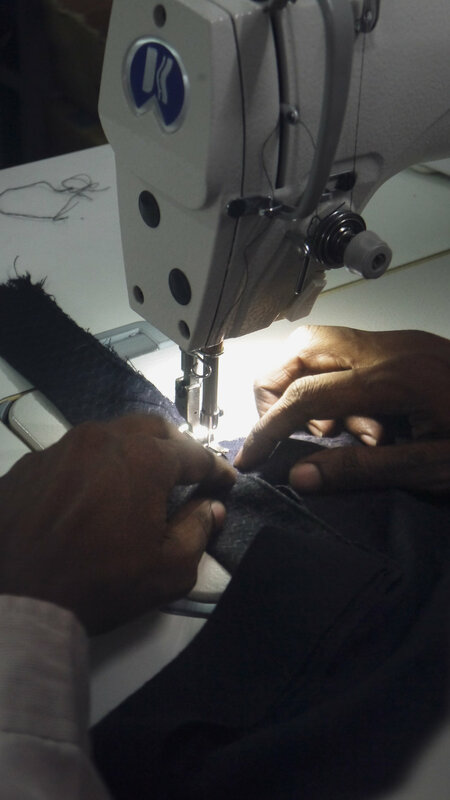 We could truly appreciate that all the tailors whilst creating our products were meticulous about their sewing and finishing, this resonates with our ethos of well-made long-lasting clothing. They’ve been taught to be proud of the products they’re producing, to work slower on each piece rather than swiftly like the large manufacturing units they’ve worked for locally. Indigenous like us believes in quality over quantity each day, that’s why they pay the employees by the hour rather the piece by piece work to ensure quality is met, over the number of units they’ve produced. We were also surprised to hear from the employees themselves that they actively choose to do over time, they enjoy working late for the social side as well as the pay. We recognised very quickly that work for them here wasn’t just work, it was a place of friendship, a calm and protected space away from those busy streets. Indigenous never pushes for the manufacturers to complete units in an unrealistic time frame or short deadline, it does mean this production method is slightly lengthier, however for the well being of the people producing our garments and for our products to be made well is vital and significant to our ethos.